I had a potential disaster today: after returning from two big commercial shoots, which I shot with my T2i in 720p 60p, I popped in the 32 gb SD card with most of the morning’s work on it, and immediately came to the horrible realization that of more than 100 files on the card, only 6 were readable. 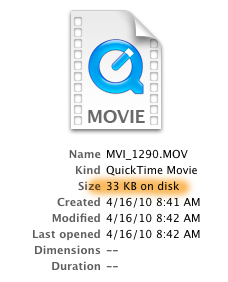 The rest of the quicktime files were visible, but showed only 33 KB on disk for each of them. Obviously, something had gone horribly wrong. I spent the next 7 hours researching all of the data recovery options available, initially without finding a solution (at one point I was so sure the data was gone for good that I contacted my client and told them I had to schedule a reshoot, never a fun conversation). But I kept trying the many tools available and finally found one that got my files back. So if you’re facing the same situation, read this first and hopefully you’ll be good to go a lot faster than I was. Two stills that I snapped during the shoot, which also showed up as 33KB files, I was able to open. 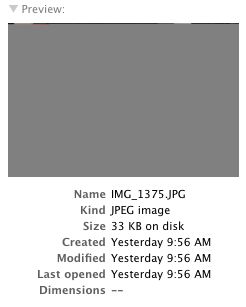 However, only the first couple of lines of image data displayed – the rest was gray. Like this (see image to right). Background: During my shoot this morning, my camera was overheating constantly – the little red temperature light was blinking like mad. But I’ve seen that before, enough not to worry about it – if it gets too hot, the camera just shuts down, cools off, and then you’re good to go in a few minutes. I had a perfect storm today: in addition to the overheating, the card got full and the battery died all at about the same time. All I remember is an error message displaying on the screen which said something to the effect of “Unable to save files to disk” and then it went black. I didn’t worry too much about it, because I’ve never had a problem before when the power dies on my T2i. But after today, I can tell you that I will very much worry about it. As best I can tell after researching this, it appears that the culprit for the lost data in my case was running out of power while shooting. Don’t let it happen to you. But if it does, all is not lost. Here’s how to resurrect your files. I’ll spare you the long list of 7 demo software applications I downloaded and tried, without success, and just jump straight into the killer app that saved the day: Klix Digital Picture Recovery. This $29 piece of software is worth every penny, and then some. After scanning my sd card, it built a list of all of the missing files. However, it did NOT include a preview – which at first led me to believe the files were not recoverable. But in fact, they were. The way I discovered this was by trying the nuclear option – a company called Aero Quartet that has a sweet piece of software for Mac that you can download to diagnose your broken Quicktime files, called Treasured. 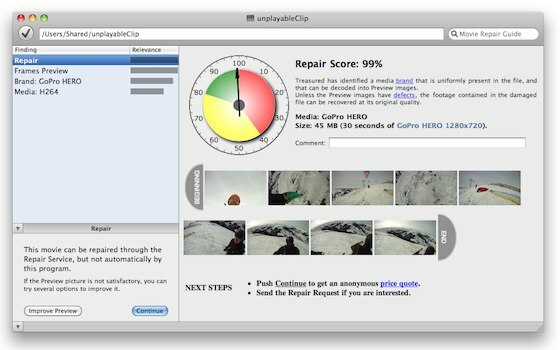 Treasured scans your damaged quicktime files, and tells you the odds that your file is repairable, and walks you through the steps of preparing it for submission to them, where a real human will look at your file, and attempt to salvage it. They will give you an estimate of how much this will cost automatically, and a real person will confirm it before you are charged. In my case, one of the diagnostic screens said “surprisingly, your file can be opened in quicktime.” I was all, huh? It can? I went back to the saved Klix file, and sure enough, it opened just fine. Audio was perfect too. Whew! I’m grateful that I didn’t have to use Treasured’s more expensive service this time, but I’m grateful for their help diagnosing my file issues and really glad to know it exists. And the next time the battery starts blinking red on my Canon dslr, you can bet that I’ll be changing the batteries BEFORE it goes dead. UPDATE: The same software also works if you accidentally format your card before downloading the files. This entry was posted in Product reviews on April 18, 2010 by Dan McComb. I had a similar problem where i accidentally pulled the battery out during recording on my canon 7d dslr. I also had the same problem on my canon 5d mkii when te battery died. I tried a few website but the cost was not cheap enough. Until i found http://www.fixdatfile.com on the creative cows forum. Fixed my file for cheap as £10!